Crypto 7 - HYIP details - HYIP Monitor GoldPoll - The Best HYIP Monitor and Rating website. The Fairest High Yield Investment Programs Monitoring Service. Crypto7 company is the first-class specialists in matters related to the development of new methods of crypto mining of Bitcoin and its derivatives using classical and advanced algorithms as well as trading activity on the worlds leading crypto exchanges. In view of the many years of operating, strong theoretical elaboration and practical experience, our company has gathered top experts to provide the best financial services to our many loyal partners worldwide as well as our new customers. We are quite well-known in professional circles for a long time and have earned the trust of regular participants on the multicurrency and crypto markets. 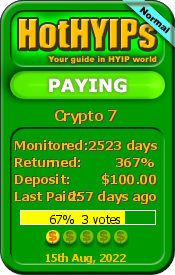 ≡ Click here to check status of Crypto 7 HYIP on some other Monitors. Realizing a lot of fake votes around and the problem of the "selective payments", we strongly wish to help our members. That’s why we would like to announce our new GoldPoll Cares campaign. If you wish, You can make the status of your Bad Vote VERIFIED. Please leave your Login and Password for your account on Crypto 7 Program. In case Crypto 7 has no members area, please allow us to visit your e-currency account, we will check your Transactions History. Just leave your e-currency Account Number and Password (we will immediately check your History of Payments and let you know so that you can change your e-currency account Password back). By leaving your Login and Password for your account You allow GoldPoll to use it to verify this Bad Vote. You allow GoldPoll to contact this program on behalf of You for the possible resolving of your problem. You understand that GoldPoll isn't associated with Crypto 7 Program and cannot guarantee any result. Report this vote Banner on their site says that you "Donald"
Report this vote Just perfectmoney !